As ever split into fiction and nonfiction. Fiction first. Brown isn’t the best writer and some of the characterisation and dialogue is wooden but you can’t deny he crafts an easy pageturner and I ploughed through this. When the detectives get a note taunting them about a murder which will be committed in twelve hours it kicks off a ticking clock thriller as they try to work out who the killer is, as well as their target. Proves writing under pressure works. A warm easy read about life, death, fate and the connections we form in our lives. A nice read and wonderfully unpretentious. Review. Clines’ superheroes vs zombies series gets better and better with two clever installments. The first sees a bizarre parallel universe and the second sees the heroes discover a new group of survivors while tensions mount back at home. Quality stuff and the full reviews are here and here. I am loving McBain’s Precinct 87 series and this is probably the best yet. 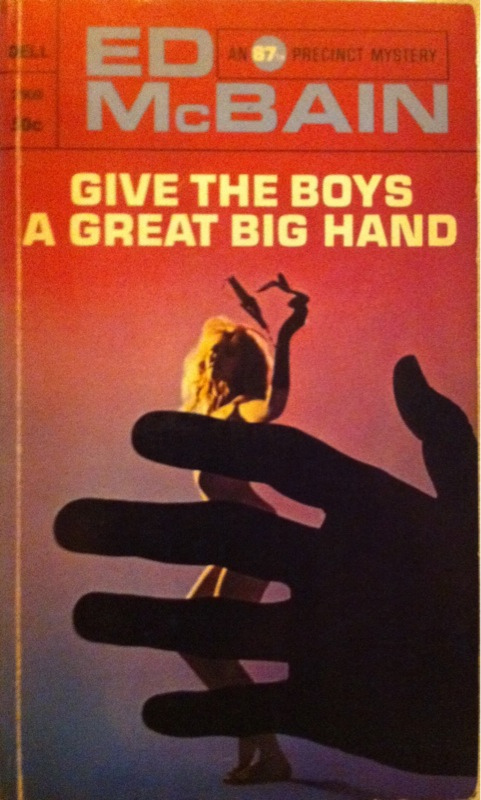 It starts with a woman entering the detectives’ office and announcing she has explosives in her bag. The rest of the book is a tense face-off as the cops try to work out what to do and Steve Carella, her target makes his way for the precinct. Full review here. Honourable mentions, all the other Precinct 87 books I read and Adrian’s Undead Diary by Chris Philbrook. Perkins’ memoir is warm, funny and incredibly moving in places. I liked her going in but I liked her even more afterwards. A real gem. Review. An honest, clever look into the life of a prisoner James has a knack for observation and telling quick, short stories which are still insightful. Full review. Massive fan of Gorman and his funny, fussy and friendly writing. Whether looking for his namesakes or examining the weird customs and conventions of modern life, he is an affable, funny narrator and I enjoyed both books. Ronson delves into the world of online jobs and shaming in a clever, funny and well researched book. He writes with compassion and he goes off in different directions. Review. A book that moved me immensely, delving into the political and personal stories behind Nelson Mandela’s ambitions for the 1995 Rugby World Cup. The great man comes across wonderfully and the optimism and healing powers of sport had me quite misty eyed. My full review here. Honourable mentions The Football Neutral by Jim Smallman and D-Day Through German Eyes by Holger Eckhertz. Any recommendations for the coming year? Let me know in the comments. BETEO. 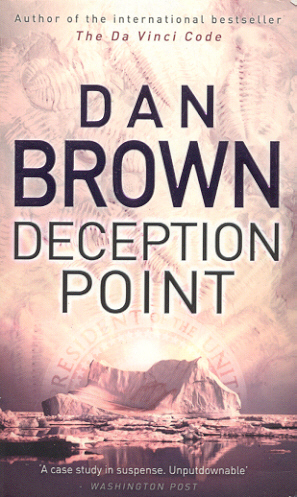 I’ve only read one Dan Brown novel before, The Da Vinci Code, and quite enjoyed it. Sure it was largely forgettable but there’s no denying that Brown knows how to craft an incredibly effective page turner and for me this book falls into the same territory- not a great book but a gripping read while it’s in your hand. The story follows Rachel Sexton, who works for the National Reconnaissance Organisation (NRO) who run a network of spy and observation posts. Her working for the government is a problem for her father, Senator Sedgwick Sexton who is in the running to be the next President due to his stance of attacking government overspending. One of the rods he beats President Herney is NASA’s budget and failures. Herney calls Rachel in and asks her to help with something very hush hush. He needs her to authenticate something as her job ensures she knows how to spot faulty or doctored evidence. She winds up in the Arctic where NASA have found a meteorite containing fossils of bugs. Big news. Unfortunately some of the evidence is shaky and when Rachel investigates with some of the independent scientists called in to verify NASA’s findings they are attacked. Meanwhile her father’s campaign aide and one-time mistress, Gabrielle Ashe, is alerted that Sexton’s anti-NASA stance may be financially motivated and begins digging. Is the meteorite genuine? If not, who has faked it and why? Who calls the shots for the elite soldiers after Rachel and the scientists? And how dodgy is Senator Sexton? The plot whips along quite nicely and Brown does a good job in making the tension build up throughout. There are enough thrills to keep you going and by using quick, short chapters Brown keeps it moving so you find yourself racing along and ignoring some of the book’s flaws. And there are quite a few. There’s a lot of scientific blather delivered through heavy handed dialogue and the characters are underdeveloped. Even the lead Rachel is a shallow, hastily created figure. Aside from a fear of water, a dead mother and a grudge against her dad she has nothing to her and the romance that develops with another character doesn’t feel right. It springs up so quickly and under such pressure that the bloke’s feeling that he can finally move on from his dead wife feels stupidly premature. Incidentally a memory of his conversation with his wife is so cheesy and TV movie like it actually made me laugh aloud. It won’t change your life and I doubt it will stick with me but it’s a gripping yarn and passes the time well enough. I blazed through it rather quickly and despite some dialogue that makes you roll your eyes it’s an engaging and gripping thriller. I was hooked in early and involved in the adventure, and am grateful I had it to help pass the time on an extremely boring shift. Verdict: Brown isn’t the best writer but he does know how to create tension and keep the reader hooked. The pacing is done well and the central conspiracy involving enough that you forgive some of the failings and go along for the ride. 7/10. I adored this book, and found myself really wanting to go out and take in a football match (it has been far too long). The book is a collection of blogs that comedian Jim Smallman wrote after deciding that while he was on the rode he may as well enjoy his Saturday afternoon away from home and decided to watch a match every chance he got. A Leicester City fan, Smallman decides that he can’t just go and watch his own team, and that he will avoid premiership matches, instead embracing lower league matches and a new team every match day. This is what makes the book such a joy as Smallman writes with warmth and affection for the teams and fans he meets along the way. From Championship all the way down to non-league he slots games into his free time and sees glamour ties like Aldershot vs Wrexham. He appears to enjoy most of the matches, describing the action with some good football knowledge and a keen eye for people watching. He’s a charming and funny companion in the stands and captures the atmosphere and appeal of going to live games. Every entry is well written and entertaining, with even the more dire matches written about with energy and wit. Throughout he is engaging and excited about football, interested in the clubs and their fans and stories. It’s also nice to see someone open about their oathing of certain clubs (for Smallman it’s Coventry and MK Dons, although he shows Coventry sympathy I would struggle to muster for Cardiff). As well as being about football it’s also an interesting look into the life of a working comedian. 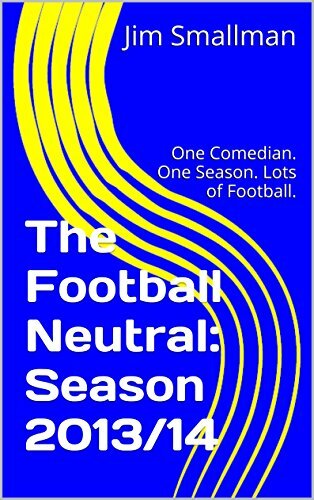 There’s a second book available collecting the next season’s matches and it has gone right into my “to read” list. It also makes me want to go see a live match again, and so in the new year I might wander over and take in a Barry match. Verdict: A warm and amusing read which will appeal to any football fan and captures life in the stands, and gives a snapshot of life in the lower leagues. Smallman is a funny and charming writer and his enthusiasm is infectious. 8/10. I’m not going to lie in the early stages I wasn’t hooked on this entry in the 87th Precinct series. The writing had the usual McBain flair and there’s some good dialogue but unlike several others it doesn’t hit with a big crime. But when it does get going it really moves. Detective Meyer is contacted by an old family friend who has been having threatening calls to his business telling him to get out. Meanwhile, Detective Carella investigates an unknown male found dead and almost naked in the park. Slowly Carella ID’s his man, but is no closer to finding a reason for his death or for why his clothes were taken. The man’s name appears to be John Smith, which seems phony and doesn’t narrow it down. At the same time a deaf man and three associates are planning something big, but what is their strategy and how are all three strands connected. This is a pretty sharp thriller with a well done plot and the usual wit and well judged dialogue which are hallmarks of the series. It’s obvious early on that the two cases will be linked but how it all plays out is well done, especially a nod to Arthur Conan Doyle’s “The Red-Headed League”. The criminal plot is grander than anything the men of the 87th have dealt with so far and McBain handles this well, talking about how the cops are always at a disadvantage and used to stupid criminals. Here they have a smart crook with an elaborate plot and it stretches the!. The villain is smug and talks of playing numbers and probabilities, and it’s nice that in the end it all wraps up thanks to gut feeling and luck. It’s not the strongest but it’s still a solid thriller and once it gets going quite gripping. Verdict: A decent thriller that takes a while to get going but soon hits its stride. McBain’s skills shine through and it builds to a tense finale. 7/10. 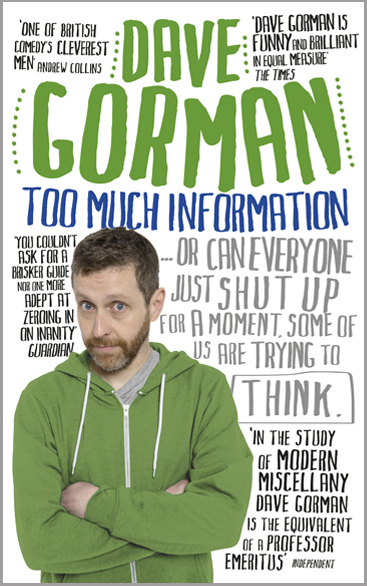 I’m a big fan of Dave Gorman, who has a witty and rather warm way of looking at the world. His stand up and writing is clever, well structured and, most importantly, very funny. In this book he turns his attention to all the little things that buzz around in modern life and which we kind of ignore, but are rather weird when you think about him. Some of the material here will be familiar if you’ve watched his show on Dave, Dave Gorman’s Modern Life is Goodish as there is a bit of overlap. But there’s more here and a greater depth, and it is interesting how much we let wash over us. He highlights the odd quirks and foibles of the internet age with a wry look and while it’s mocking the tone is easy and avoids nastiness. He seems aware that he’s over thinking things in places but his general thrust is that we do need to pay attention as otherwise these rude things will just become “how things are done”. It’s written in quick, bitesize entries and this means it’s the kind of book you can dip in and out of when you have a few spare minutes. Verdict: A clever and funny read, an easy and light read. Gorman’s tone is warm and avoids being too nasty. A good read to dip in and out of. 8/10. This is another cracking instalment in the 87th Precinct series and is quite an interesting one. It opens with a patrolman seeing someone leaving a bag at a bus stop, and doing his duty he looks in the bag to find a severed hand. With nothing else to go on, Steve Carella and the other detectives begin trying to find who the hand belonged to and who left it at the bus stop. Their investigation leads them to two missing men, but they have no further leads, until they find an unexpected connection between the men, a stripper named Bubbles. The problem? Bubbles is missing too. 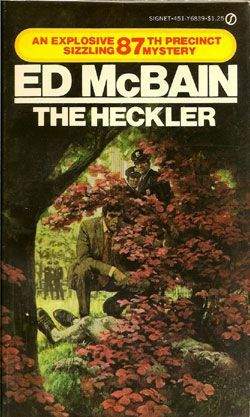 Like the other stories in the series this is a well crafted crime story which is helped by McBain’s knack for character and humour. The story unfolds at a decent pace and the shifts between different detectives keeps it fresh and further develops the characters who have been built up over the series. It’s not the strongest in the series, with a slightly rushed ending, but it’s still an entertaining book and solid thriller. Verdict: A well done thriller as can be expected from McBain, with a decent plot and some nice touches. 7/10. Finally the US Presidential election is drawing to a close. The process is so long and convoluted that by now everyone just wants it over with. I’m hoping that Hilary Clinton emerges as the victor because despite her flaws the alternative is terrifying. Donald Trump is an irresponsible narcissist who would be too much if he was a fictitious character. Nobody would buy it. But sadly truth is stranger than fiction and The Donald (contender for lamest nickname ever) is a walking, talking embodiment of some of the worst personality traits out there. That he has made it to the final two is depressing. As with the Brexit result in the UK, Trump’s success has emboldened bigots and racists. They see the popularity as a sign that the tide is turning and more people are agreeing with them. After the election, regardless of result, the hornet’s nest of hate, fear and anger which has been stirred up will not disappear overnight. Trump has found favour with the far right and the “alt-right”, which is the focus of this short book by Jon Ronson. 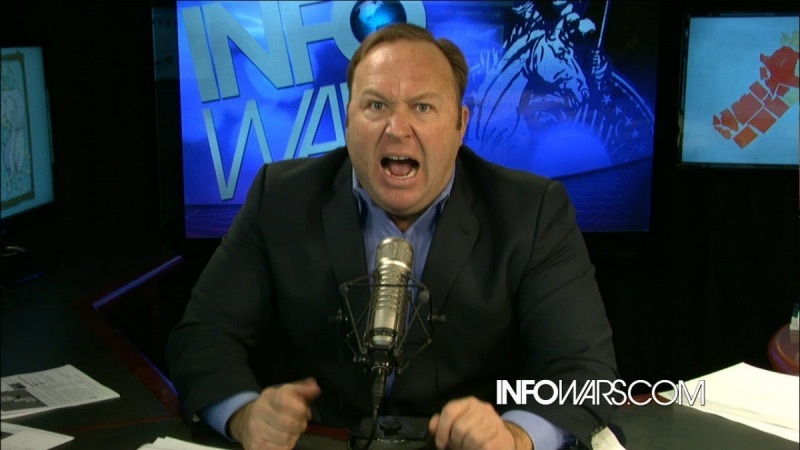 It focuses on an old acquaintance of Ronson’s, Alex Jones who he met while investigating conspiracy theories for Them and who some may know for his intense rants online on topics like government cover ups, Satanism and Justin Bieber. It’s an interesting and well done read, with Ronson amiable and honest in his writing. He admits that, despite Jones’ more out there theories, he likes the man. He talks about attending Trump’s rallies and of the almost cult like atmosphere, of how the fringe appears to have taken over the centre. It’s hardly new ground, although I did learn some more about the background of Trump’s associates and it’s interesting to have a snapshot into the supporters. It’s almpst sad that Jones is shown to have fallen for Trump’s platitudes and attempts to win his support in a way a more experienced media figures saw through. 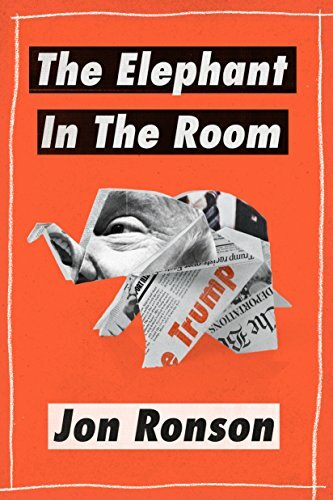 Ronson also touches on how polarised politics have become and how entrenched positions have become, it’s an interesting look at the current political landscape in the US as they prepare for their election. Verdict: A short, well written piece by Ronson which gives a quick look at the fringe players in the Trump story and his rallies. It’s not comprehensive but it’s still a decent and insightful read. 7/10. 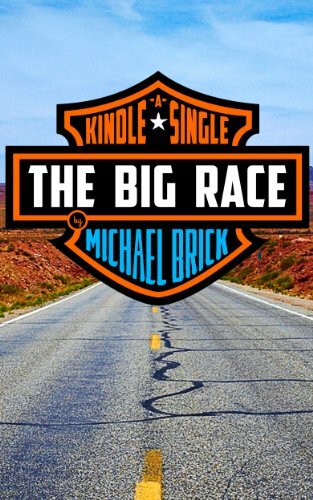 A cross country motorcycle race featuring a host of odd characters from across the USA. The whole thing set up by a man with a questionable past and dodging allegations of being a con man, but who claims to be doing it to help the Native American community that adopted him. That all sounds very interesting doesn’t it? That’s what attracted me to pick this up on my Kindle, but unfortunately as a read it doesn’t quite measure up to the premise or reader expectation. It’s a Kindle single so part of this is down to length but a larger problem is that Brick never probes that deeply. There are hints that the organiser of the challenge is an eccentric, suspicious chap but it never gets to whether he is a con man or not. In fact Brick struggles to capture a sense of any of the players beyond brief, simple sketches. And as the book unfolds all the questions that are set up go unanswered. Worst of all the writer is quite a way from the action of the race. Brick talks about wanting to work out more about Jim Red Cloud, but never delves that deep and instead relies on a couple of hints and a sneaking suspicion he holds, but the man remains a mystery. The writing is readable and unfussy, which isn’t always a bad thing, but here it just feels flat in places and the lack of humour or genuine insight makes this an immensely forgettable book. Verdict: An intriguing premise is let down by shallow examination and lack of any real narrative arc. Too brief and light to make much of an impact or satisfy the reader. 3/10. This is the second book by Haggard I’ve read, having quite enjoyed King Solomon’s Mines and intrigued by the premise of this book, which sees a journey to find a mysterious, mythical queen known as She-Who-Must-Be-Obeyed. I’d seen a bit of the Ursula Andress movie and it seemed a fun adventure story. Which it is. In places. The central premise is a neat idea, as is the way it’s set up with an ages long story passed through a family for centuries, but it’s in the telling of this story that Haggard starts dropping the ball. He talks about the story of a woman who escaped She and the son she bore, and her hope they would return to the kingdom, and describes it as being done in several languages. This is fair enough, but he shows the different languages and drags this section out far too long. Less is more, dude. The other problem I had is there’s something of an anti-Semitic vibe to comments that She and others make, and as, with Solomon’s Mines, the ideas about different races are very outdated. 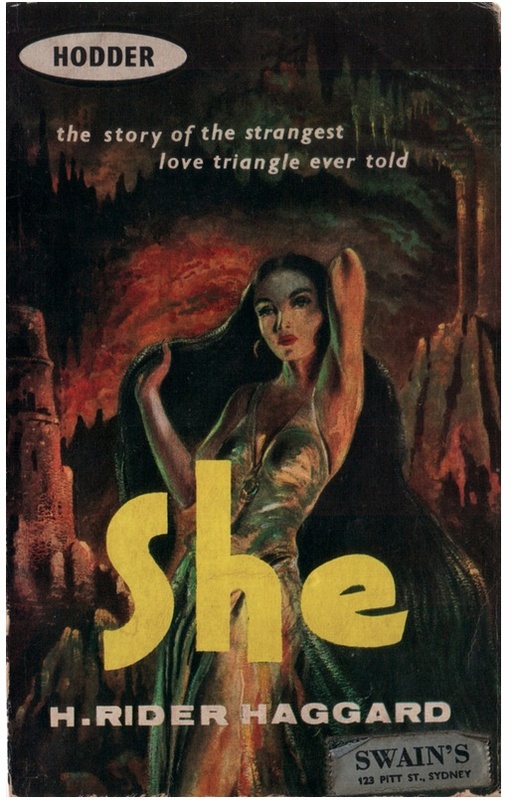 And while there are a few thrills early on, far too much of it is a slog and while our narrator talks about how fascinating She is I couldn’t help finding her infuriating. It’s a decent premise but feels like a wasted opportunity. and the climax is unsatisfying and flat. And the narrator is poorly chosen, with a self pitying streak which makes him appear whiny and rather pompous too. Verdict: There are some nice ideas here but it never delivers on a good idea and there’s not enough action to keep it going. The finale falls flat and it’s a slog in places. 3/10. 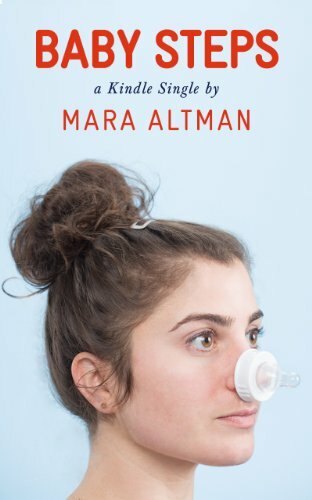 This is the fourth book I’ve read by Altmann and like the others it sees her respond to a personal issue by researching the topic and writing about it. In this case, the fact that everyone around her is having babies and that, newly married, she is being asked about her own plans around children. Altman talks to family, friends and experts about society’s obsession with babies and the pressures on women to become mothers. It’s personal and humourous but it touches on some big issues about parenthood and gender roles. Throughout Altman asks herself whether she even wants kids herself, and flip flops back and forth on this issue. To see if she’s suited to motherhood she tries on a fake belly, looks after a robot baby and these are quite interesting side stories but really this is about her weighing up her options and trying to make the right decision for her future. It’s a Kindle Single so rather short, and some ideas are half explored, but it’s still a warm and entertaining quick read. Verdict: Altman writes with warmth and humour, and this is a quick and entertaining read about one woman deciding what she wants to do with her life. 7/10.